Wondering how to remove Sharpie marker and other everyday stains from your quartz countertops? Luckily, quartz countertops are one of the easier types of surfaces to clean and look after. But, although they’re simple to maintain, they are not stain-proof. It is important to take the right steps to keep your quartz countertops looking new and free from marks and stains. If you are going to be using a Sharpie or any permanent marker, try putting down some protective placemats or craft paper first. However, if you’ve got kids, this might just not happen! Should you find an ink or permanent marker stain on your countertop, it’s important to address it immediately. Wet a cloth with a product designed to remove tough marks such as Goo Gone® and rub it into the stain. Afterwards, rinse the spot with warm water to remove any cleanser residue that is left over. However, you should always mop up spills immediately using a soft cloth and mild dishwashing detergent. • Gently scrape glue from the countertop using a razor. • Use a pH neutral quartz cleaner to finish cleaning the surface. • This technique will work on other dried-on tough stains such as paint. • Use a mixture of baking soda and warm water and rub in with a soft cloth. • Rinse the cloth and get rid of any residue left behind. • This technique works well on fruit and vegetable juice stains too. Like any area of your home, you need to keep your quartz countertops clean to ensure they look their best. Clean your countertops daily and pay attention to any spills, ensuring they are wiped up immediately. Also, deep clean your surfaces at regular intervals using a non-abrasive cleaner. 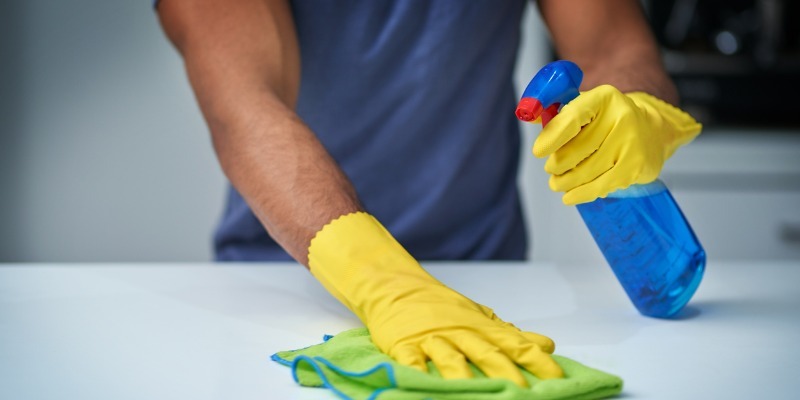 Let the cleaner sit for ten minutes and then remove it with a non-scratch sponge or cloth. Never use abrasives or acid/alkaline cleaners. If you’re unsure about a cleaner, ask the experts at Rock with Us first. Also, avoid extreme heat on your countertops. After time your quartz countertops could crack due to the exposure to extreme temperatures. Use a heatproof mat, or cooling rack for hot pots and pans. It’s also important to always use a cutting board to avoid scratching the surface of your countertops. Have questions about how to care for your quartz countertops? Contact Rock with Us for countertops in and around Hamilton and Southern Ontario.